Val Britton’s first solo exhibition at Gallery Wendi Norris features a site-specific sculptural installation alongside a collection of mixed media works on paper. 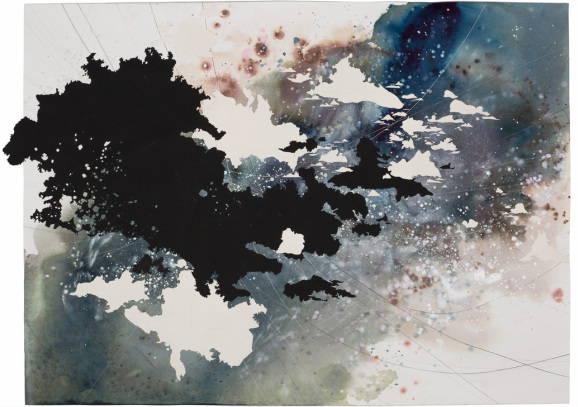 Her abstract collages made from cut paper, ink, and watercolor are exquisitely orchestrated with an almost musical composition, balancing intricate linework with an organic, free-flowing use of pigment. Her installation made from cut paper and string mirrors the aesthetic of her two-dimensional work but adds the element of movement, namely the ascending shape of the piece as a whole and the enigmatic rustle it makes with the slightest motion. Britton derives the forms and shapes present in her collages from the language and imagery of maps. This decision was inspired by her father, a long haul truck driver, who passed when she was very young. Britton uses the maps of the routes he often travelled and extracts information and imagery from her father’s itineraries, essentially piecing together an imaginary past based on the geography her father traversed during his life. 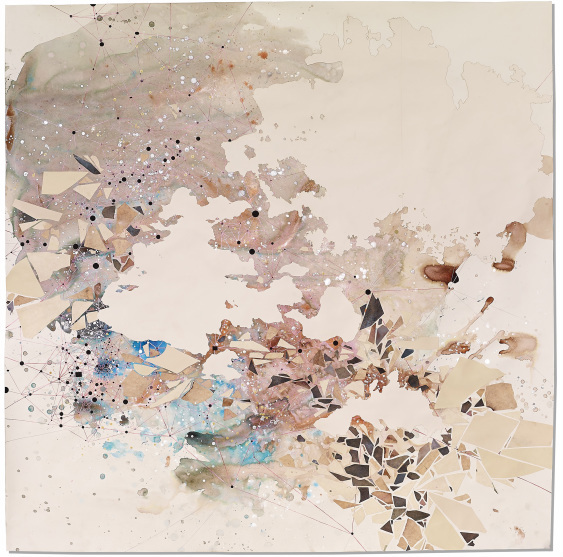 Working from these abstracted shapes and interconnected landscapes, Britton creates complex psychological roadmaps of imagined experience and memory. Her abstracted collages illustrate a vivid terrain yet retain a metaphysical quality. Lustrous pools of pigment take on a textural quality that matches the cut edges of layered paper, recalling images of lakes and mountain ranges. At the same time, the interconnected lines meeting at several marked points resemble a charting of stars. This duality evokes a sense of wonder and levity. The viewer could be staring down from high above at some imagined landscape or looking onward at a celestial body floating in space. With her two-dimensional work as a backdrop, her installation mirrors her intentions and methodology in a physical way. It invokes a similar levity in its composition and materiality. Made up of cut paper forms hanging on lines of string, the installation sways with the lightest provocation. The lines of string act like the lines on the paper connecting integral points both in the installation and in the environment of the gallery. Its size and presence in the space guides the way visitors travel through and experience the exhibit, calling attention to the connection between the body and the pathways it traverses. Passage will be on display at Gallery Wendi Norris from June 5th to August 2nd, 2014.